Redmire's white lady? - or just mist? Redmire Pool...what is there to say that hasn't been said before, especially when you've returned from a cold and damp blank in November? Well, as Bernard Venables put it, "surely an angler is more than a catcher of fish?" - and this is certainly true of anyone at Redmire, which is a most special place. 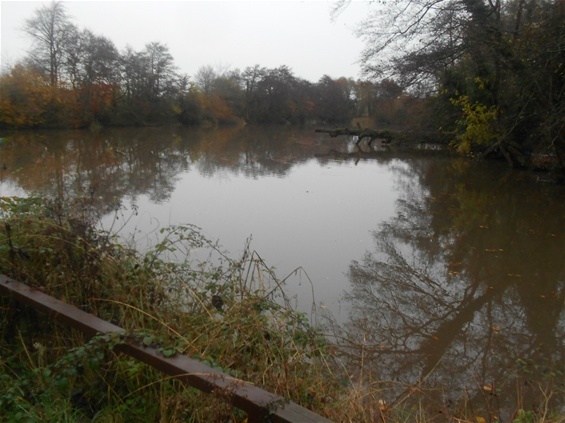 For me, however, the Redmire moments came in fits and starts, not least because I am used to fishing Herefordshire carp ponds which are similar in size and appearance to the great pool. The first thing I had to overcome, then, was a sense of familiarity - not disappointment, because I love farm lakes - but the sense that I had been there before - which wasn't the case, of course. This was my first time. I was pleased to note that the water was nowhere near as stirred up as I had been led to expect by recent publicity. Staring out from the dam, to that iconic scene, (enhanced I think, by the fallen oak), I noticed that the water was a greeny brown, but peering into the margins, I also noticed that I could see some way down - at least two feet or so, and so I must conclude that visibility below the surface of Redmire is still far greater than we think. I was fortunate on my visit to have the company of three splendid lads - Derek, Daryl and Paul, and they really helped to make the trip extra special for me. Only Derek was a Redmire veteran, and his optimism and enthusiasm, when he shook my hand at the car park, really helped to raise my spirits and expectations, despite the weather forecasts for deluges and more deluges - a forecast that turned out to be absolutely correct. Then came the moment to pick swims. I ended up going for the Willow - Walker's pitch, because I thought it might be a good swim for the night. Derek, Daryl and Paul were all on the East Bank, and so I effectively had the run of the West Bank - all the way up to the Number One peg, - which I fancied for stalking during the day. Paul went for Cranstoun's, the corner pitch by the dam, and this proved to be an informed choice, because he would leave Redmire with two twenties and an eight to his credit, as the only angler to catch that weekend: a remarkable and well-deserved achievement. All this was ahead, however, as the rain began to fall; a heavy rain. As darkness settled, I began to think about the other aspect of Redmire, aside from carp, which has made the pool well known. I mean its ghosts, of course! 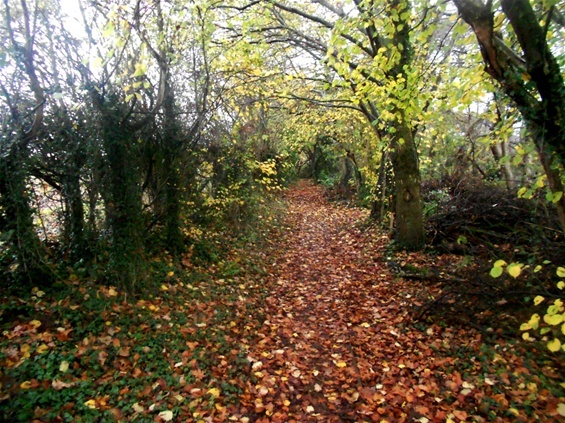 I have to say that hearing the multiple owl calls and the crackle and taps of rain over fallen leaves, it is easy to imagine all sorts of things. The leaves do crackle, and that can sound like approaching footsteps. I did, looking back, have a few odd experiences, which in fact I'll put down to fatigue; but for the sake of the record, I shall give them here. Firstly, Derek told me that, on an earlier session in the Stumps, he had heard someone call his name. On my second night, I woke up to the sound of a distinctly female voice, calling my first name - or had I been dreaming? The second night was indeed the creepiest night for me. I awoke at around 4am to make coffee and re-fill my hot water bottle, and I just had the sensation of being watched - and no doubt I was being watched, as the Redmire critters are many and varied - from rats and mice to squirrels. But this was something else. 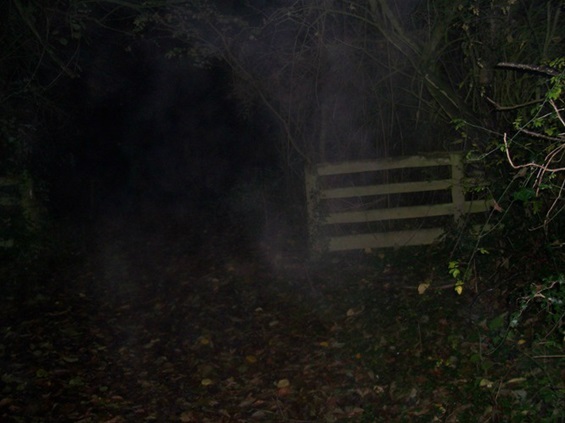 I decided to grab my camera and shoot towards the boat-house and the dam, and one image does seem to show a misty, white female(ish) figure by the gate - and in fact I do think it was mist, - as a chill rain was falling I could see my breath, However, at that time of night, with my body cold and damp and my mind reeling, I was more than a little freaked out. Only one other strange experience needs mentioning, before I return to the actual fishing, and again I must put this down to fatigue. After my "ghost" experience, I sipped my coffee in my low chair and stared out over the pool. I had a strong Redmire moment then, as I had the night before: staring at the silhouettes of trees and thinking how that very same sky-scape must have been seen by Walker and Thomas, on the night when Clarissa was caught. It sent a delicious shiver down my spine, to think that. I don't mind admitting, though, that I prayed for peace of mind, and soon my eyes closed I was on the edge of sleep. Now, remember how very dark it was? - well - suddenly my closed eyelids were "lit-up" - as if it were day; - that's the only way I can describe it, and it was a steady light, like daylight. I opened by eyes and it was still pitch black; but when I closed my eyes again, the same thing happened. I don't know what it was - a brain-wave perhaps, in a too weary mind...? I will say, however, that the "light" made me feel protected, and I was glad of it, then. Another big Redmire moment for me had come on the Saturday, when I was fishing the Number One peg. I saw two big mirrors leap out by the willow to the side of Hilton's, - and then a smaller but still chunky common; and so I put a ledgered bait out, (I must confess here, a very non-traditional blood-worm boilie), close to the willow, and I waited. 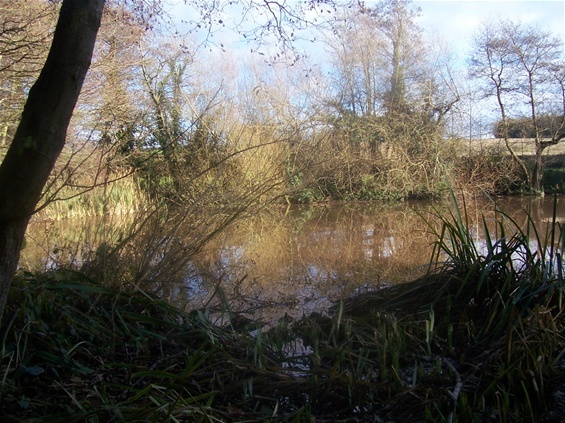 The reeds where Kevin the Scarecrow once stood in a Passion for Angling were still green and splendid, although a raft of spent autumn leaves had settled against them. A carp's back rose in these leaves, and so I cast out triple sweetcorn to the edge of the floating leaves, to give me another chance. I really did think it would work, and in fact I had bleeps on both alarms - including just after the common jumped over my baited area! But it was not to be, and as evening settled I moved everything back to Walker's Pitch. My only other chance came at around 5am on Sunday morning, when something caused three bleeps on my ancient Optonic and pulled the bobbin up by one inch or so. But this little run did not develop further. I must mention, here, a major reason for going carp fishing, and that is the good fellowship of other anglers. I hadn't met Paul, Daryl or Derek before the session, but that didn't stop them cooking me a fine English Breakfast on the Saturday. Paul had just experienced a real family tragedy, - but that didn't prevent him being worried about me, a stranger, when he discovered I was sleeping on an air bed. He insisted I take his spare unhooking mat, to put beneath the mattress and stop the damp from striking up too much. I was extremely touched by his gesture of kindness and consideration. I was delighted, then, that Paul was the one to get among the fish. I'm only sorry that, as all the fish were caught in the night, and I was on the opposite bank, while the rain fell and fell, I did a "Fred J. Taylor" and stayed in my tent, and so I missed out on all the excitement! I think it's fair to say that Redmire impressed us all, and we all want to get back some day. Thanks must go to my dear brother David here, who paid for the trip as a birthday treat. In the meantime, I hope to see Paul, Derek and Daryl in the banks of the "The Other Pool" next year - a pond which is of a similar size and atmosphere, and while it may lack the real monsters of "The Mire", I am sure it also holds one or two surprises. I will get around to sending you a couple of photos of Pauls fish, but I haven't got one of his ' Big Un'. Many thanks - I look forward to seeing them, very much. Hoorah, I've found you. For whatever reason you wasn't showing up when searching through my homepage!!!! Anyhow, a great weekend had by all, in great company. Welcome to The Gnome! Yes, it was indeed a super weekend. Glad you enjoyed it.strong resemblance to other pool we fished.The sense of the history of Redmire must be very strong and of all others who have gone before. 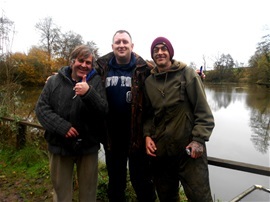 Great weekend indeed, Darryl, and I look forward to fishing with you all again..bed a bivvy for the winter, instead of a tent? Most certainly! Lol!